Investigators found skeletal remains in the woods in Delhi Township on Wednesday, March 20, 2019. 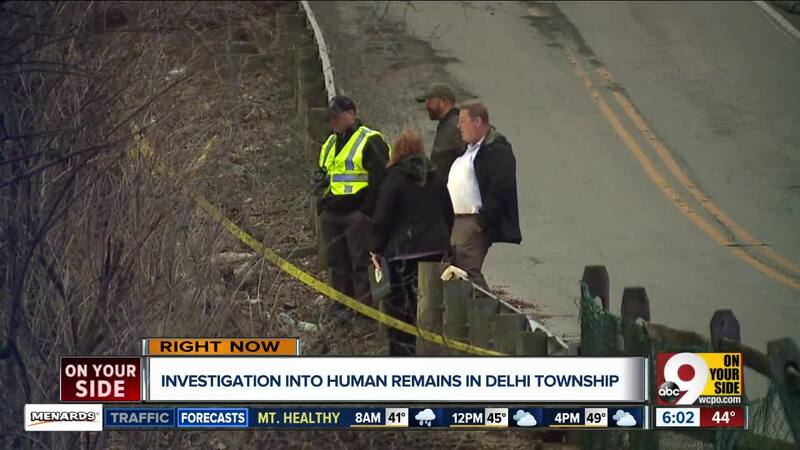 DELHI TOWNSHIP, Ohio — Passersby discovered skeletal human remains in a wooded area of Delhi Township Wednesday evening, according to police. A man who had been walking in the woods found the the remains at about 5:15 p.m. near Rosemont Avenue, Delhi Township Police Department Assistant Chief Jeff Braun said. Braun said the remains consisted of “very few pieces of bone structure,” and investigators don’t know much about the person’s identity, how long they’ve been there or how they died. “It’s hard to say how they got here … once we get to the point where we can hopefully identify who they are, then we can let somebody’s loved one know their remains were found,” Braun said. Haley Dawson was at the scene Wednesday night. She said she’s hoping the remains belong to her uncle, Joshua Wright, who has been missing since February 3, 2018. “Every day we look and search and hope that there’s answers,” Dawson said. "We run here, we go wherever we have to go to see if it's him, no matter how the distance is." Authorities don't know whether the remains are that of an adult or a child, Braun said, and they can't determine whether the person was a male or a female. The remains were found in one general area on the border of Delhi Township and Cincinnati’s District 3. Braun said investigators would look in the area again on Thursday. “Sometimes with skeletal remains, sometimes animals in the wooded area scatter the bones a little bit,” Braun said. Police and seven volunteers from the group Texas Equusearch continued combing the area Thursday, carefully searching on their hands and kneews for anything that can help investigators figure out who the person was. "They're helping us," Delhi police Lt. Joe Macaluso said. "They're experts in locating missing people in this type of situation." The search turned up more remains Thursday, police said. Authorities took the bones to the Hamilton County Coroner’s Office, where they will work to identify the person. Anyone with information should call the Delhi Township Police Department at 513-922-0060 or Crime Stoppers at 513-352-3040.